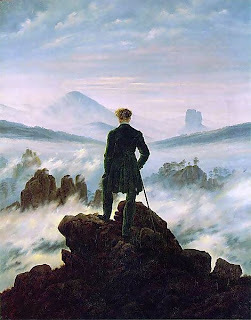 Titled for obvious reasons, this piece by Friedrich is the epitome of Romanticism. Friedrich was a 19th century landscape painter. He was a master of his time, and the best of the allegorical landscape painters. He is well known for creating a emotional response to the natural world. Friedrich work often pushes the viewer to see his or her relation to the world. Also his work was based on the idea that Europe was on the break from materialism, and in new appreciation of spirituality. This piece like many of Friedrich's pieces places a person in deep thought silhouetted in front of a dramatic landscape. The first thing that catches my attention is the obvious figure that pops in the foreground (his deep green contrasting the bright white background). The next piece of this image that also draws my idea to the central figure is the orthagonal lines created by the trees in the background. I believe this was another attempt to get the viewer to think about his/her relationship to the natural world. Another way he creates this feeling is the breathtaking view of this landscape. Leaving a feeling of awe by creating this incredible and almost realistic view.